The Rev. Heather Erickson moved to San Francisco in August of 2017 and is grateful to have found a home at St. John’s a few months later. 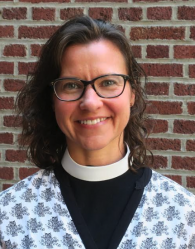 She is currently serving as Interim Chaplain at St. Paul’s Episcopal School in Oakland. A native Californian, Heather ventured east to pursue her M. Div. and graduated from the Virginia Theological Seminary in 2011. She has served as an Associate Priest at All Saints’ in Beverly Hills and as a School Chaplain and Assisting Priest at St. Margaret’s Church and School in San Juan Capistrano. Heather is inspired to help the church evolve into the future, and feels it’s vital to give our traditions cultural relevance. She is grateful for glimpses of God’s kingdom, the practice of yoga, and being outside in the sunshine, especially if it involves a compelling book. Heather’s husband is also an Episcopal priest, and they have two children.